Join us on October 13th in front of the church. 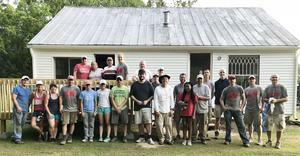 GA families traveled to Frenchburg, Kentucky to help a neighbor in need. Classes begin on September 12th. Next session scheduled for August 11th. Join us after the noon Mass on June 3rd. GA to host VIRTUS session on May 24th. Children ages 5-8 invited to attend Guardian Angels Bible Camp. Volunteers Needed For Family Mission Trip June 14-17. Families must register by May 1st. We are looking for your input to help guide the future direction of our parish. Join us every Friday during Lent. The Lenten Series and Soup Suppers will be held on Mondays: February 19, February 26, and March 5. Topics will be on Suffering With Christ, Lent & the Eucharist, and St Francis & the Way of the Cross. Supper begins at 6:00 pm and with the talk at 7:00 pm in the undercroft.